Lexus RX450h first drive video blog | What Car? Join What Car? group editor Steve Fowler in Hungary as he gives you all the important numbers and facts that make up the new Lexus 450h. It's all about the numbers, too, as the RX450h has more power, lower CO2 emissions and even improved fuel economy to tempt would-be SUV buyers. 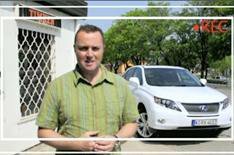 Click below to get all the facts and figures from Steve in his What Car? video blog. Click here for more video news stories. You can subscribe to our video through iTunes, too.